Team USA may soon force SPA into creating a new division. Two years ago they won the 50 AAA and were moved up, in 2016 they won the 50 Major crown and moved up. This year they added the SPA 50 Major Plus crown to their list of accomplishments. Team USA went 3-0 in bracket play beating Suncoast Addias 13-12 in the title game. They didn't exactly run away with the championship as they only beat Team 1 Sports 31-29 and Suncoast Addias 21-20 in earlier bracket games. Playing in 100-degree weather conditions, Rose used his entire roster of 15 players. “If they didn't start one game then they were runners in that game, the next game they started and we used other runners. I just wanted to keep everyone as fresh as I could..” Rose said. It has been a good season for Team USA winning five of the seven tournaments they played compiling a 45-7 record. They still have a couple of tournaments left on the 2017 schedule. Members of the 2017 SPA 50 MAJOR PLUS World champions are: coaches Dutch Detwiler Jr and Jimmie Johnson. Players are Michael Allegretti, Verdell Blackston, John Casner, James Devine, Michael Dill, Ernest Donaldson Jr, Jay Ehrhart, Edward Farrell, Stephen Heller, Bob Jones, William Kelly, Reid Miller, Kenneth Shemonski, Charles A. Smith and Ronald Wenrich. Alabama's Team Kitty only used eight of its nine lives to take home the 2017 SPA World 50 Major crown. They did it by going 2-0 in pool play and 5-1 in bracket play beating RB Lawncare 22-10 in the “IF” title game. RB forced the “IF” game by beating Miami Power 18-17 in the loser's bracket finals and then beat Team Kitty 25-21 to force the extra game. Team Kitty had sent RB Lawncare into the loser's bracket with a 23-17 win earlier in the tournament in the battle berween two underfeated teams in the winner's bracket finals. With the tournament win Team Kitty upped their season record to 46-9 with eight tournament titles in the ten events they participated. It will really be hard to find tournaments in 2018 now that they are Major Plus. 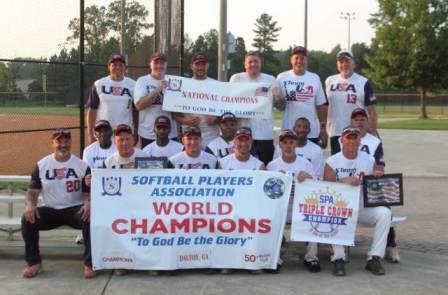 Twenty teams took part in the double-elimination SPA World Tournament held in Dalton, Georgia July 20-22. Team Kitty went 2-0 in pool play with wins over TeamWood Law 17-14 and Goodtime/Clean Planet 27-12. RB Lawncare was second followed by Miami Power, Team Champion, Phenix Tube, Team Wood Law, Lighthouse, Texas Mavericks, Hit N' Run, Texas Vets, Ohio Elite, Walker Brothers, LS/DTN, Atlanya Monarchs, Team Elite Miken, Doc C's, Goodtime/Clran Planet, Team Arkansas, Monster Softball, and Public Enemy. Coach of Team Kitty is Richard Otinger. Members of the SPA WORLD'S50 Major championship team are: Paul Hardin, Robert Brown, Spencer Kennedy, Charles Miller, Davod Reynolds, Timothy L.Lee, Ronald Hollingshed, Roger Teate, Bert Moore, Gerald Donaldson, Kevin Gillor, Joel Majoes, Partrick Madden, Robbie Clark, Paul Robinson and Otinger. The SPA Sylvania Ohio Great Lakes Classic is closing in on the "50" team attendance figure as 45 teams attended this year's tournament. The event held at Pacesetter Park, one of SPA's top facilities, drew 45 teams for the August 3-6 tournament. "We had great turnouts in all age groups except the 75 AAA," SPA rep Jerry Keefe said. "I think that was due in part to Thee Buckeye Classic and Shelbyville tournaments being so close scheduling wise. The eastern 75's do not look forward to traveling to. Ohio and Indiana three times in a space of two months. "The Great Lakes Classic made up for the loss of the 75 division by bringing in eight 55, 65 AAA and 70's teams. The 65 AAA bracket saw Doc Martens/Rope Course finally put it together to win a big tournament. The "Doc" gang went 5-0 in bracket play to win the 65 AAA crown. Doc Marten beat Universal 23-5, CAVCO 15-14, Michigan Lakers 20-12, Brantford Nissan 23-22 and Rochester Royals 21-16.Universal. Softball was second followed by CAVCO, Ohio Silverado's, Rochester Royals, Chicago Pride, Rush Trucking and Sylvania 65'sThe Dayton Legends bounced back from an earlier 18-23 bracket loss to Rush Trucking beating the Michigan team twice 23-15, 21-13 to win the 70's AAA crown. COSSA was third followed by Windsor Chiefs, Chicago Strikers, Steel City, Frickers Sports Bar and Hewcor Bandits. Another Dayton team, the Dayton Legends 55's ran the table got win the 55 bracket. The Legends beat Team Elite twice 17-6, 21-20 and Buckeye Classics 18-10 and Allshred 33-13. Team Elite was second with JJ Financial, DC Connection, Buckeye Classics, CPOA, Jackson Merchants and All Shred finishing out the bracket The seven team 50 AAA bracket was won by Canada's Homer Lovers but beating Trinity Rizzo 30-18 in an "IF" game. The Ohio Hitmen were third followed by Flytime, Diversified Machine, Lakeshore Trucking and Dayton Legends. Windsor Chiefs gave Ontario Province two champs as they won the 60 AAA crown beating Detroit Lugnuts 22-7, 23-12 to seal the deal. The Lugnuts were second followed by JP Motormen, Minutemen/Pepco and Sideline Sports/Bull Moose. Canada's Durham Silver Stix won the three-team 60 AA bracket beating Dayton Diamond Dawgs twice 18-0, 25-14. Hewcor finished third. Pfeiffer Grey Sox bested Peachtree 27-11 to win the 80's championship. Hamel was third and Syracuse Cyclones fourth. Canterbury beat Michigan Merchants 17-4, 21-5 for the 75 Major crown.